In order to enjoy polite society, and to be thoroughly suited for it, we must have a knowledge of those rules and regulations which the custom and common consent of well-bred people have established and drawn up into a kind of social code, entitled Etiquette. To render the public familiar with this code is the object of the present work. Etiquette has a long and fascinating history. Reference to the correct order of precedence is mentioned as early as in Beowulf, when Wealtheow the queen, “mindful of etiquette,” takes the goblet first to the King then to the courtiers. Not surprisingly many of the procedures and orders of precedence centred around the court from which, like the circles from a stone dropped in water, they expanded into all classes and places. By the end of the late eighteenth and early nineteenth century, the influence of certain individuals who were considered masters of social etiquette, or at least setters of the fashionable trends, men like Beau Nash and Beau Brummell, was strongly affecting British polite society. The rules they imposed were often mere whims, but so powerful were they as arbiters of taste that it is said that the Prince Regent was careful never to leave his waistcoat unbuttoned beyond that degree that Beau Brummell stipulated as correct. essentially part of the history of the battle for refinement and civilization, and above all the better protection of women, against the promiscuity, animalism, brutality and grossness which had been common even in the eighteenth century. By the middle and late years of the Victorian Era, the most trivial demands of etiquette could lead to the downfall of one in the upper strata of society. Poor speech or the incorrect usage of terminology might prove fatal. As “Madge” in one of her guides to etiquette pointed out, “coffee” must be pronounced “cawffee”, “lunch” is never heard in good society–the meal is “luncheon”, calls are “made,” not “paid,” and one drinks “tea” but doesn’t “take” it. All through the Victorian Era, knowledge of what was correct seemed to become increasingly important, particularly for women but also for men in their relations with women of their own or better classes. In the process, and as part of the attempt to maintain a degree of exclusivity, the rituals became gradually more trivial and progressively more exacting. Etiquette had truly become a game for the initiates. 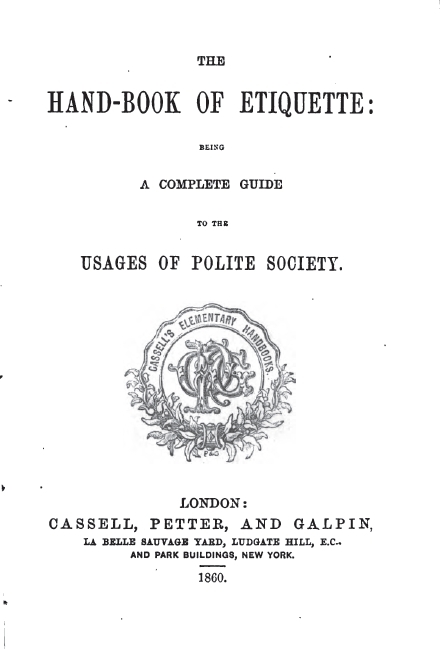 To download Routledge's Manual of Etiquette (c. 1860), click here. A dispute between a tailor and a customer hardly seems newsworthy. Even should the matter go to court, it would be unlikely to merit more than passing notice in a local newspaper. Yet in May of 1873, just such a dispute (Creed and another v Walters) was the subject of great interest in papers around London, ranging from the Daily News to the Illustrated Police News. The story even made it into the Western Mail in Cardiff. What made this case so remarkable was the defendant in the case was Catherine Walters, better known as “Skittles” and the most celebrated courtesan of the middle years of Victoria's reign. So popular was she - or at least so well known - that The Penny Illustrated Paper and Illustrated Times thought it sufficiently amusing to make her case the subject of one of its frequently appalling puns. "'Skittles' speaks of a fashionable tailor as being 'one of the old war-horses of the trade.' A heavy charger we suppose." the defendant, Miss Walters, was a lady very well known in London and in Paris, and her personal attractions had secured for her a very considerable number of admirers, under the protection of some of whom she had from time to time lived. The argument was over a bill in excess of three hundred pounds for riding habits and numerous alterations. Nor was this the only time Skittles name was to appear in the popular press. Just three years later, when she was in Paris, the following appeared. 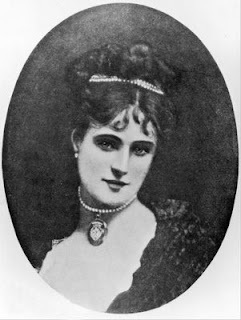 Miss Catherine Walters, an English lady, who may, perhaps, be better known to some of your readers than she is to your correspondent, brought an action, which came on for hearing yesterday, against M. Faure, the well-known publisher, demanding damages for injury to her reputation occasioned by a book called 'Memoires d'une Biche Anglaise," with her portrait in the title-page. The curiosity of the public met with a disappointment, for it happened that - to use the words of a disappointed Irish attorney - a 'compromise broke out between the parties.' The publisher undertook to destroy all the copies of the work remaining on hand, and the lady's counsel declaring that she scorned to make the action a monetary speculation the affair was concluded. Again, in 1890, her name featured in the case of Beauclerk v Beauclerk in which Skittles was named as having been intimately involved with the husband almost thirty years earlier. Such was the power of her name that it took precedence over the names of several others with whom the husband was involved. Although the couple had been living separately for twenty years, the court held that there were no grounds for a dissolution of the marriage since there was no proof that the husband had molested his wife or interfered with the custody of their child in the years of their separation. During the sixties and seventies, the grand decades for the courtesans, Skittles was the most talked abut and admired of the breed. She was, as William Hardman so bluntly put it, “a w[hore] sir, much sought after by fast young swells.” With all of the most elegant women of the day she rode, through the season, in Rotten Row. The Danae! the Amazons! the lady cavaliers! the horsewomen! can any scene in the world equal Rotten Row at four in the Afternoon, and in the full tide of the season? asked the journalist, George Augustus Sala. There the dandies of London gathered at the wooden rails, ladies in their crinolines strolled accompanied by their footmen, children played in the park and here and there one could see “wicked old bucks, splendidly attired, leering furtively under the bonnets” of respectable women. in their ravishing riding-habits and intoxicatingly delightful hats: some with the orthodox cylindrical beaver, with the flowing veil; others with roguish little wide-awakes, or pertly cocked cavalier’s hats and green plumes. Who rides the best horse in the row? Who drives the most rampageous ponies? Whom do all the best girls ape in dress and deportment, and in equipage if they can; aye, and in talk too? Who first set the fashion of the ‘pork pie’ hat? Who restored the ancient chimney pot? Why one of our ‘pretty horse-breakers. "And there, as Alfred Austin, later Poet Laureate, wrote in 1861, “… defiant, spurning frown and foe,/With slackened rein swift Skittles rules the Row./Though scowling matrons champing steeds restrain,/She flaunts Propriety with flapping mane." She had a passion for horses and was a first class rider. Sir Willoughby Maycock, as a young man, was riding home from the hunt with his father when two riders raced past “and were over the fence and in front of us in the twinkling of an eye.” One, a woman, “wore a habit that fitted like a glove, and a bit of cherry ribbon round her neck. … she was a perfect dream.” As they pelted past, she shouted to her companion, Jim Mason, the winner of the 1839 Liverpool Grand National, and one of the finest horsemen in England, that she expected when they reached home her bottom would be as red as her ribbon. It was, of course, the incomparable Skittles. Skittles was painted by Sir Edwin Landseer and had poems written to her and about her by Wilfred Scawen Blunt aas well as Alfred Austin. Her notoriety was such that even without being named, it must have been clear to readers of Blackwood’s Edinburgh Magazine that the criticism of Landseer’s “The Shrew Tamed” was referring to Skittles, especially since the model (not Skittles herself) looked so much like the lady in question. “The Shrew Tamed”--a high-bred horse of soft silken coat, dappled with play of light and shade as on velvet--subdued by a “pretty horsebreaker,” is certainly unfortunate as a subject. 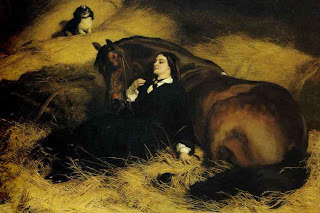 ... We hope it will now be felt by Sir Edwin Landseer and his friends that the intrusion of “pretty horsebreakers” on the walls of the Academy is not less to be regretted than their presence in Rotten Row. Skittles lived into her eighties, long enough to see the end of the First World War. In her last years she would take the air, pushed in a bath-chair in Hyde Park, where once she had ruled the Row. To read the report of the case of Creed and another v Walters as it appeared in The Daily News (London, 6 May 1873), click here. It is commonly believed that the first practicing Jew to sit in the House of Commons was Lionel de Rothschild. Technically this may be true, but the first practicing Jew to vote in the House was David Salomons (image on the left), a cousin to Rothschild. In 1851, in the Greenwich by-election, he was returned as the member for that constituency. Salomons was a newcomer neither to politics nor to public life. He had stood unsuccessfully for Parliament on no fewer than three previous occasions. In 1837 and 1841 he had unsuccessfully contested Shoreham and Maidstone respectively and in 1847 had failed yet again at Greenwich. 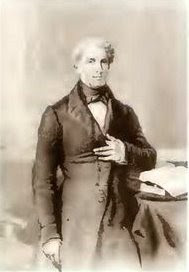 And although Rothschild had been elected five times in the decade between 1847 and 1857, he had been denied his seat for his failure to swear the oath of abjuration “on the true faith of a Christian.” Salomons had made clear his objections to this sort of thing before. 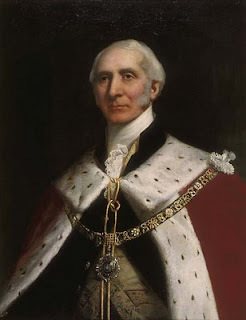 In 1835, and again in 1844, he had stood for the court of Aldermen of the City of London and while elected in both instances, his objection to the form of oath required meant that he was unable to take his seat. Unlike his cousin who had, in a most gentlemanly way withdrawn after making his point, Salomons decided to try a different approach. After his election in 1851, he took the oath, simply leaving out the words “on the true faith of a Christian.” After taking his seat, Salomons voted on three divisions. The House of Commons debate that followed on from this was extensive and, would, at times, have bordered on the hilarious had not the issue been so important. The question, put to the Commons on the 2nd of July was, "That David Salomons, Esq., is not entitled to vote in this House, or to sit in this House during any Debate, until he shall take the Oath of Abjuration in the form appointed by Law.” Clearly the issue was twofold. The first, and more technical issue, was whether or not the words that Salomons had left out were a necessary part of the oath which he took and by his failure to recite them he made the oath null and void. The second and broader question; and the one which many of those debating the issue hoped to avoid, was whether a practicing Jew should be a member of the Parliament of the United Kingdom, a "Christian" nation. "was worse than useless—it was most objectionable to compel Members when they first entered upon their duties in that House, whether they were Christians or Jews, to go through the solemnity of taking that unnecessary oath: it was a practice calculated to impair the idea of the sanctity of an oath, and to weaken the sense they would otherwise have of the engagements which upon such occasions they might fairly be called upon to enter into. If the oath itself was obsolete and unsuited to the times, the mode in which it was taken was still more improper, and, in his mind, approached even to blasphemy. In the first place, they handed to a Jewish Member coming to the table of the House an Old Testament, thereby recognising his denial of the truth of Christianity, and then, after recognising his denial of the truth of Christianity, they called upon him to swear upon the true faith of a Christian." "We heard it elaborately argued, and I, for one, formed my own opinion. I was clearly of opinion that the judgment of the Court of Exchequer was right. In both Houses of Parliament I have voted for the admission of Jews to Parliament. I thought that the law by which they were excluded was unjust, and I have therefore, on all occasions when the question has been introduced, voted for their being admitted constitutionally and lawfully. But sitting as a Judge, in which capacity I had not to make but to declare the law, it appeared to me that the arguments of the three Barons who decided against Mr. Salomons were unanswerable, and that it really was the intention of the Act of Parliament, when read and fairly construed, that no person should be allowed to take that oath except in the manner which is prescribed by the Act of Parliament." Certainly Salomons had brought the issue of admission to the Parliament for non-Christians to the forefront of political debate, but the price exacted against him was indeed severe. He was fined £1,500 for having voted on three occasions and as a result of his conviction stood to suffer civil penalties including becoming "liable to deprivation of the right to be a party to any civil suit, to be a guardian of a child, or an executor, and to the loss of several other rights of citizenship." Government action, however, removed all of these liabilities with the exception of the fine. Over the following years numerous attempts were made by the House of Commons to remove the passages in the oath which kept Jews from membership in the British Parliament. All of these efforts were continuously obstructed by the House of Lords until, in 1858, a compromise was achieved which allowed each house to determine the nature of the oath required for admission. Thus it was, that seven years after Salomons first took his seat and voted in the Parliament, Lionel de Rothschild took his seat in the House and only a year later, at the general election that Salomons was returned from Greenwich, the constituency which he continued to represent until his death in 1873. In the interim, Salomons was knighted in 1855 after being elected the first Jewish Lord Mayor of London (see picture to the right) and in 1869 received a baronetcy. And while Rothschild, once admitted to the Parliament, never spoke in that body, Salomons remained an active member giving more than 250 speeches in his Pariamentary career. To read Lord Campbell's summary of the case, click here. For many, images of the darker side of Victorian London are shaped by the descriptions of writers like Henry Mayhew in the middle decades of the century, or by Blanchard Jerrold and Gustave Doré, and James Greenwood a few decades later. In addition to their often sensational images there are the descriptions we derive from the fiction of the times. Thus, our image of Victorian London's drug culture, if indeed such a culture existed, is composed in part of sensational journalism and in part of sensational fiction. Among the writers of fiction who concerned themselves with the use of opium and the opium dens that were supposed to be a part of the darker side of the great Metropolis, particularly in the years of Victoria's reign, were Oscar Wilde, Charles Dickens and Sir Arthur Conan Doyle. The question we are faced with is whether the descriptions are an accurate portrayal or overdrawn and sensationalized accounts. One of the best known scenes involving the taking of recreational drugs is found in Sir Arthur Conan Doyle's tale, The Sign of the Four. Sherlock Holmes took his bottle from the corner of the mantel-piece and his hypodermic syringe from its neat morocco case. With his long, white, nervous fingers he adjusted the delicate needle, and rolled back his left shirt-cuff. For some little time his eyes rested thoughtfully upon the sinewy forearm and wrist all dotted and scarred with innumerable puncture-marks. Finally he thrust the sharp point home, pressed down the tiny piston, and sank back into the velvet-lined arm-chair with a long sigh of satisfaction. It was this performance that Dr Watson had been witnessing "three times a day for many months;" a performance he found both disturbing and dangerous. There are two primary images one is left with when considering the use of opium or its derivatives, the most common of which, in the nineteenth century was laudanum, a tincture of opium widely used as a painkiller. On the one hand, we have the image of its use amongst artists and writers, including both Coleridge and DeQuincy in the early years of the century. Later, Wilkie Collins was a regular "drinker" of laudanum for the pain of gout and other maladies. Among other Victorians using laudanum were Elizabeth Barrett Browning and Charles Dickens. Elizabeth Siddal, Dante Gabriel Rossetti's wife, died as a result of an overdose of laudanum and Rossetti himself was to follow her to the grave, in all probability as a result of his own overuse of laudanum and opium. The second image is that of something resembling a widespread network of opium dens throughout the United Kingdom, spreading like tentacles from its centre in London. Such an image is a gross exaggeration. While there were opium dens in London and in all probability in most of the port cities of the United Kingdom, they were few and far between. 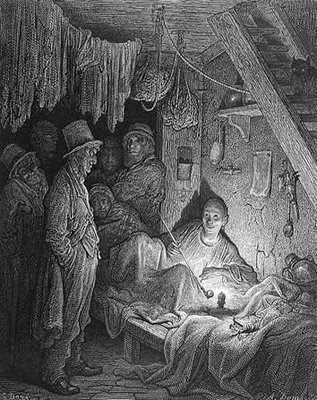 In most cases they catered to the habits of seamen addicted to the drug and there is no evidence of any "network" of opium dens. a vile alley lurking behind the high wharves which line the north side of the river to the east of London Bridge. Between a slop-shop and a gin-shop, approached by a steep flight of steps leading down to a black gap like the mouth of a cave, I found the den of which I was in search. ... I passed down the steps, worn hollow in the centre by the ceaseless tred of drunken feet; and by the light of a flickering oil-lamp above the door I found the latch and made my way into a long low room, thick and heavy with the brown opium smoke, and terraced with wooden berths, like the forecastle of an emigrant ship. Through the gloom one could dimly catch a glimpse of bodies lying in strange fantastic poses, bowed shoulders, bent knees, heads thrown back, and chins pointing upward, with here and there a dark, lack-lustre eye turned upon the newcomer. Out of the black shadows there glimmered little red circles of light, now bright, now faint, as the burning poison waxed or waned in the bowls of the metal pipes. The most lay silent, but some muttered to themselves, and others talked together in a strange, low, monotonous voice, their conversation coming in gushes, and then suddenly tailing off into silence, each mumbling out his own thoughts and paying little heed to the words of his neighbour. ... As I entered, a sallow Malay attendant had hurried up with a pipe for me and a supply of the drug, beckoning me to an empty berth. Such descriptions are no more sensational than those that appeared in the newspapers and journals of the day. An article in the French journal Figaro, reprinted in the Pall Mal Gazette, in 1868, puports to describe an opium den, in Whitechapel. It is a "wretched hole,"
... so low that we are unable to stand upright. Lying pell-mell on a mattress placed on the ground are Chinamen, Lascars, and a few English blackguards who have imbibed a taste for opium. In the agricultural as well as the factory districts of England the consumption of opium among adult workers, both male and female, is extending daily. Anthony Wohl, in Endangered Lives: public Health in Vicorian Britain, has pointed to the Fens where "poppy tea" was widely drunk and used for general medicinal purposes with a consequent wasting in children and possibly malnutrition leading to death. had no doubt that consuming opium, either in the crude or liquid state, or inhaling it from a pipe, tended materially to shorten life. Not that such warnings were heeded. Opium and tinctures of the drug were readily available and inexpensive and, as one writer to The Daily News of 23 June 1879, commented, he was astonished at the widespread use of opium to keep children from getting cross. He went on to point to the "infinite detriment" to children of the extensive use of "opium, soothing syrups, and other baneful cordials ... by large masses of the mothers among our labouring population." So, what can we make of this? I think there are three conclusions that might be drawn. First, the smoking of opium was seen as a vice practiced by orientals. The constant reiteration of this in both works of fiction and popular journalism suggests a clear level of xenophobic content. Second the misuse of laudanum appears to have been largely associated, in the public mind, with its use amongst the lower and labouring classes. Finally, it tends to reinforce the view implicit in so many elements of Victorian life that those in the better classes might engage in the same practices without them being considered vices unless and until they were carried to extreme excess. To read Charles Dickens' The Mystery of Edwin Drood, click here. Oscars? Pah! We've been nominated for "The Excessively Diverting Blog Award"
It is with great pleasure that this blog announces that it has been nominated for The Excessively Diverting Blog Award. The nomination came from Helen Webberley, blogmatresse of ART and ARCHITECTURE, mainly. 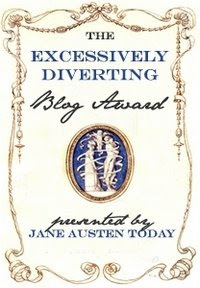 The aim of the Excessively Diverting Blog Award is to acknowledge writing excellence in the spirit of Jane Austen’s genius in amusing and delighting readers with her irony, humor, wit, and talent for keen observation. Recipients will uphold the highest standards in the art of the sparkling banter, witty repartee, and gentle reprove. This award was created by the blogging team of Jane Austen Today to acknowledge superior writing over the Internet and promote Jane Austen’s brilliance. Victorian History. Bruce writes one of my favourite blogs because the quality of the writing is top notch. Several times I have used his material as a springboard, then gone on to read more about the topic. Please forgive us this little "ego" trip, but we are touched and honoured by this recognition from one of our peers and want to share it with our readers. PS: Boy am I embarrassed! I was so excited I failed to notice that I was supposed to "nominate seven (7) other blogs that you feel meet or exceed the standards set forth." So, over the next few days I will be thinking about that and will add them to the list below - with comments. The Virtual Dime Museum (http://thevirtualdimemuseum.blogspot.com) is the creation of "Lidian" who clearly loves all of those wonderful bits and pieces that make up the ephemera of history. Lidian also maintains a wonderful blog on - of all things - kitchens. It is Kitchen Retro (http://kitchenretro.blogspot.com) and it probably deserves a nomination in its own right, but I reckon one nomination is all I'm entitled to give and it has to go to the Virtual Dime Museum. The Victorian Peeper (http://victorianpeeper.blogspot.com) UK Politics said of the site that it "Combines scholarship, a range of subjects, a light touch, and excellent images and links." In addition, it is literate and very well written. Kristan Tetans, who maintains the blog is a fine scholar and a joy to read. The Diary of Samuel Pepys (http://www.pepysdiary.com). I'm not sure that this is really eligible, but it is a truly remarkable site. Phil Gyford uses Pepys own writing for each of the days as a diary entry. His annotations are first-rate, making Pepys wonderful writing clear to even the layman. Whose writing deserves the award - Pepys or Gyford? Does it really matter; it is a great blog. Promenades, piers, Punch and Judy, music hall - where else could a Victorian on holiday possibly be but at the seaside. Whether at Brighton, Margate, Bournemouth, Weston-super-Mare or one of a hundred other resorts, one of the most popular forms of holidaying for the emergent middle-class during the latter half of the nineteenth century was a visit to the seaside. Most "white collar," or to use a more Victorian term, "black coat" workers received a week's holiday every year. Frequently this coincided, as in the case of Mr Charles Pooter, the lower middle-class clerk in Diary of a Nobody, with the August Bank Holiday. With many others, Mr Pooter took his family to Broadstairs, a coastal town on the Isle of Thanet in East Kent about 76 miles east of London. By the middle years of the 1860s, Broadstairs was served by rail with its station located about a ten minute walk from the seaside. Here the Pooters took lodgings in a boarding house near the station where the cost was about half of what they would have paid closer to the sea. Broadstairs Beach at around the turn of the century is pictured on the left. And where bright groups of summer idlers strolled. The reality, however, was that the quality of such seaside accommodation ranged from excellent to pretty awful. Udny Yule recalled going to the seaside as a youngster. "Keating's Powder [a powerful insecticide] was an invaluable item in the outfit for the summer holidays." He had, he went on, "dreadful recollections of our taking a house at the seaside ... a doctor's house - out of which we fled the next morning, hopelessly routed by its hordes of saltatory inhabitants." A typical seaside holiday featured walks along the shore, donkey rides, bathing, band concerts, and Punch and Judy shows. For those women wishing to bathe in the sea, there were bathing machines which could be hired. These consisted of a wooden shelter on wheels which was dragged into the sea by a horse or a donkey. Within the enclosure, one could undress and change into one's bathing costume with absolute decorum and, for those not brave enough to actually swim, they offered a secure site from which to splash in the water. No seaside town could possibly be complete without a pier where one could play games, go on rides and engage in all of those activities traditionally associated with a seaside holiday even today. The reality, however, of such a holiday was often less exciting than the prospect. Mrs Pooter, for example, probably found that the case for when her husband commented, "I don't think we can do better than 'Good old Broadstairs,'" Carrie, much to Charles' "astonishment, raised an objection to Broadstairs for the first time." Mr Punch, never slow to comment on the social peculiarities of the middle-class summed up the seaside holiday in verse entitled "A Seaside Reverie." From my little caddy her matutine tea. And never be seen on my board any more. And swiftly decrease, though untouched all day. It is ... curious ... how little seaside customs, amusements, troubles and delights, have varied in the last half-century. Landladies are at the end what they were at the beginning; the same old type of bathing-machine is still in use; our forefathers and their womenfolk in the days when Mr. Punch was young behaved themselves by the "the silver sea" just as their children's children do to-day. Nothing has changed, except that the most select of seaside places is no longer so select as it was in the pre-railway days, and that the wealthier classes, preferring the attractions of Continental resorts, are less in evidence at our own watering places. For many, the annual trip to the seaside was little more than an extension of their home life. The Pooters, for example, were delighted to run into their neighbours and seemed to spend much of their time at the seaside exchanging visits with them. Once again we can turn to Mr. Punch for his view of such meetings. Wearied by London Dissipation, the Marjoribanks Browns go, for the sake of perfect quiet, to that picturesque little watering-place, Shrimpington-super-Mare, where they trust that they will not meet a single soul they know. Oddly enough, the Cholmondeley Joneses go to the same spot with the same purpose. Now, these Joneses and Browns cordially detest each other in London, and are not even on speaking terms; yet such is the depressing effect of "perfect quiet" that, as soon as they meet at Shrimpington-super-Mare, they rush into each other's arms with a wild sense of relief! The seaside holiday, although not a Victorian invention, was brought to fulfillment by the middle-class throughout the latter years of the nineteenth century. And while much changed - for example the growth of municipal orchestras which took the place of the military band concerts in many of the seaside resorts - much remained the same although a certain more relaxed attitude seems to have emerged as the working class moved into many of the seaside resorts for their holidays. To download Mr Punch at the Seaside, click here. During the long reign of Queen Victoria the key social event of the year was always "The Season." 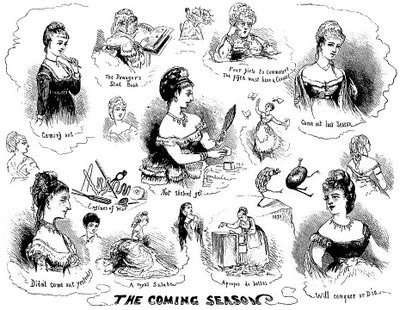 There were a number of specific social events connected with the season, but the most important event for many was the formal entrance into society of the young women of the upper class; their "Coming Out." Coming out was a very Victorian ritual although it had its origins well before those decades. For the daughters of the aristocracy, this meant presentation at Court. it commonly occurred when a young woman reached the age of eighteen and was, in the words of one etiquette book "the hall-mark demanded of those who aspire to fashionable life." Not all of those who came out, particularly in the last years of the century, were from the aristocracy. If one had the right contacts it was possible to be presented. The informal embargo on those whose papa's were either manufacturers or significant tradesmen, however, began to break down towards the end of the century. By the 1890s, one popular book on etiquette could pronounce that being presented at Court did not "carry such distinction with it as formerly, as nearly every one with any pretensions to wealth or position contrives to get an entrance to her Majesty's Drawing-room." For a marriageable young woman, the season was often the most important event of the year, for she knew that she had, at best, only two or three seasons in which to confirm her future through marriage. The first season would be her coming out, but if she was not successful in the marriage race, she knew she still had one, or at most two, more seasons in which to find a mate. Were one fortunate enough to be presented at Court, preparation began weeks, sometimes months, before. First there was the clothing required for the momentous few minutes in which one was presented to the Monarch. Cynthia Asquith described the process as "a violent sudden change as though at a word of command a butterfly had to break her chrysalis and instantaneously spread her wings." The metamorphosis called Coming Out was supposed to be effected when you were presented at Court, where the wand was officially waved over your head. The picturesque rites of this social baptism were preceded by weeks of trepidation - weeks busied with long lessons in deportment ... and panic-stricken rehearsals of my curtsey ... then there were endless wearisome hours of trying on. 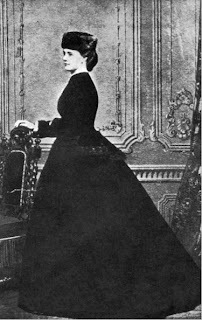 When, in the following season, she returned to the social scene, and "reappeared in London ballrooms," there was comment about the events of the previous season and according to Cynthia herself, the worldly-wise shook their heads and pronounced her coming out a "very badly bungled production." A lady about to be presented at Court must appear, if a spinster with two, and if married with three, feathers disposed on her head so that they are visible from the front, and with two long lappets of tulle or lace (two yards in length) flowing from the back of the hair. She must wear a low bodice and short sleeves, and a train coming either from the waist or the shoulders, not less then three yards in length. The gloves must be white, and never tinted with a colour, except in cases of mourning, when black or lavender are allowed. For Cynthia, after the dressing and primping, after the interminable hours of being fitted for the dress, the final dreaded hours arrived. Her hair was "tonged" and "three stiff white ostrich feathers ... stuck into ... [her] newly corrugated head." She was laced into her "billowing white crepe-de-chine dress" and an immensely long and unmanageable train" fastened to her shoulders. Finally prepared for the event, the party left Cadogan Square for Buckingham Palace. Ghoulish dowagers froze ... young blood by reciting disasters that had befallen debutantes. They did not even spare ... the story of the wretched girl who from extremity of nerves had been sick in her SHOE (what commendable presence of mind to tke it off) on the very footsteps of the throne. On entering the Presence-Chamber, the debutante let down her train which was immediately spread out by two lords-in-waiting. She would then approach the Monarch, curtseying as low as possible "so as almost to kneel and the Queen kisses her on the forehead if she is a peeress or peer's daughter, or extends her hand to be kissed, if the lady is a commoner." Lady Cynthia Asquith described her experience on entering the Royal Presence. After curtseying to the Monarch and any other members of the Royal family who might be present, the debutante "then passes on, keeping her face towards the [King or] Queen, and leaving the room in a succession of curtsies". It was over and now it was time for the enjoyment of innumerable balls, dinners and other social events that made up the season; and time to start thinking about marriage! To read Lady Cynthia Asquith's description in full, download her book, Remember and be Glad, by clicking here and reading pages 57-84. To see a guide to the etiquette of "Presentation at Court": download Modern Etiquette by clicking here and reading pages 34-36.